October 20, 2014 by Joon Yun, M.D. You are probably aware of the concept of second-hand smoke, which increases the risk of disease and death. You should probably be aware of another deadly scourge: second-hand stress. Natural selection has wired us to sense the stress of others and make it our own. If you are a gazelle and you don’t freak out when others around you do, then you might be the one about to be consumed by a predator you haven’t seen yet. Animals detect the stress of others through various sensory signals such as alarm calls, olfactory cues, or visual behaviors. Plants detect distress signals of others in the form of ethylene gas that activates their own stress response (fittingly, second-hand smoke contains ethylene). The ability to detect second-hand stress is a survival instinct that can promote evolutionary fitness. April 3, 2014 by Joon Yun, M.D. 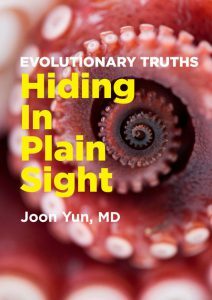 Hiding In Plain Sight is a collection of essays that I have written on investing, healthcare, and life. For the sake of experiment, read the next sentence once, while counting the number of “f”s that you see. Most likely, you counted an “f” in each of the more vibrant words of the sentence: “five,” “flies” and “scientific.” Most people only see these three “f”s, when in fact there are six. The other “f”s are hidden in the unassuming preposition “of”. Your mind probably skipped over each “of” because it processed these words without absorbing the raw information of the letters that composed them. January 5, 2013 by Joon Yun, M.D. Although heart disease is common today, it was likely a far less frequent cause of death than predatory assaults among our prehistoric ancestors. Anyone reading this article is the fortunate descendant of an unbroken lineage of organisms that escaped or survived predatory attacks before reproducing. The responses that help us survive predatory attacks are collectively called the fight-or-flight system. This system drives three major vascular responses to injury: coagulation (to counter blood loss), vasoconstriction (also to counter blood loss), and inflammation (to combat microorganisms and to promote wound healing). Together they helped our predecessors survive a predator’s bite. These responses are called upon reflexively no matter what the source of injury. February 2, 2012 by Joon Yun, M.D. Food allergies are a rapidly growing medical and public health problem. Recent studies estimate an incidence of 5% in children younger than 5 years old and 4% in adults. In severe cases, subjects can experience anaphylaxis and even death if exposed to a food to which they are sensitive. There is no known cure. Rather, doctors recommend that the sufferer avoid exposure to the allergen. The mechanism of disease is thought to be immunologic. February 1, 2012 by Joon Yun, M.D. Evolutionary medicine (also referred to as Darwinian medicine) is the application of evolutionary theory to the understanding of human ailments.1 2 3 It explores evolutionary mechanisms of disease, offering a complementary framework to the proximate mechanistic explanations that prevail in medicine today. In this paper, we consider the application of evolutionary theory to the treatment of ailments. A major contribution of evolutionary medicine is the framing of human diseases as maladaptations of our prehistoric factory settings. Our physiologic processes were shaped during prehistoric evolution to meet the needs of the era, but those same processes may behave maladaptively in the modern environment and produce disease. We take that notion one step further and propose an overarching therapeutic paradigm for human ailments based on evolutionary theory—the induction of adaptations in the body as a way to treat disease. It is the idea of creating somatic traits in the body that evolution might otherwise need to create over many generations through the sheer force of variation and natural selection. In the same way, that evolution has endowed us with traits that shield against biotic and abiotic stress to maintain homeostasis, we propose treating patients by endowing the body with buffers against ailments. Ethylene: The Most Important Molecule You’ve Never Heard Of? January 1, 2012 by Joon Yun, M.D. Ethylene is a gaseous hydrocarbon with the molecular structure C2H4. It is commonly produced when hydrocarbons are exposed to oxidative stress, such as that found during lightning, volcanic eruptions, forest fires, and photochemical reactions on the ocean surface. Plants coopted ethylene biosynthesis during evolution to manage their response to oxidative stress from biotic and abiotic sources. Further exaptations of ethylene include modulation of plant life history events such as development, transformation, senescence, and death. Due to a number of factors described below, humans may be subject to increasing ethylene exposure. The potential health consequences of ethylene exposure are not part of the public consciousness and warrant further exploration. May 7, 2009 by Joon Yun, M.D. The concept of the importance of eating a balanced diet took on major cultural significance in this country when the U.S. Department of Agriculture released its first Dietary Guidelines for Americans in 1980 — a response to an increase in heart disease amongst Americans in the 1960’s. The Guidelines are updated every five years to incorporate the latest advances in medical and scientific research, based on the recommendations of the 11-member Dietary Guidelines Advisory Committee, a group of widely recognized nutrition and medical experts. The U.S. government directly or indirectly feeds approximately 54 million people daily according to these guidelines — including over 25 million school children. These numbers are not lost on those in the food, agriculture, and diet industries, who are all busy promoting their particular points of view. They work to install members to the committee whose support they can count on, ostensibly in order to ensure that the committee itself has a ‘balanced’ view of diet and nutrition. In such a politically charged environment, what do we end up with? A ‘balanced’ diet indeed, with a little something on everyone’s plate. While the experts disagree on what constitutes a diet balanced for optimal health, most presume the need for ‘balance’, and the importance of consuming a wide variety of different foods. The guidelines have changed over time, with the recent addition of an emphasis on physical activity to offset caloric consumption. The debate remains largely centered, however, over which foods reside at the top and which languish at the bottom of the food pyramid, rather than the validity of the approach itself. September 23, 2008 by Joon Yun, M.D. Warren Buffett once famously stated that “Berkshire [Hathaway] buys when the lemmings are headed the other way,” conjuring up visions of rodents blindly following one another off a cliff. But the idea that lemmings participate in mass suicide is a myth, propagated by a Disney documentary. The widespread misuse of the lemming metaphor by investors to illustrate herd behavior itself reveals the herdlike behavior of investors and the scarcity of original insight. Original insight is also uncommon among doctors. Physicians are trained through rote memorization, and independent views are often ridiculed by peers and prosecuted by malpractice attorneys. The hiring of physicians as consultants by investment firms seeking unique perspectives has instead led to a greater tendency toward consensus thinking. November 19, 2007 by Joon Yun, M.D. A doctor-turned-stockpicker says he’s bearish on stents. YOU DON’T HAVE TO BE A MEDICAL DOCTOR to pick healthcare and biotech stocks, but it doesn’t hurt. The graduate of Harvard and of Duke Medical School hadn’t been looking to leave his day job. But when a colleague had to bail on an interview with Palo Alto, which was seeking a doctor to oversee healthcare investing, Yun filled in on a whim. The rest is history. Since joining PAI, Yun has never had a down year. The three-year return of Palo Alto’s $250 million micro-cap fund, heavily weighted toward healthcare and biotech, is nearly 23%. Over five years, the return is close to 30%. August 1, 2006 by Joon Yun, M.D. Joon Yun, MD, began considering how evolution applies to human health a decade ago when his first heart disease patients died. These cases disturbed Yun, then a Stanford radiology resident. But they also intrigued him. Having studied evolutionary biology in college, Yun tried fitting these medical failures into that framework. His mind wandered to the early days of humans when heart disease was a rare trigger of death. In the prehistoric era, a more likely cause of death would have been an attack by a predator. The human body’s response to trauma handles this type of assault by immediately springing to action: The blood forms clots and the blood vessels tighten, together with slowing blood loss, and inflammation kicks in to combat infection. The genes governing these responses to trauma presumably were favored during evolution and have become the “factory setting” in modern humans.